Captain! We've heard you can't live without the thrill of adventure. If so, Pirate Chronicles is the perfect game for you! Ready yourself to raise the Jolly Roger and sail the Seven Seas in this addictive time-management game! Find fortune, glory, and true love. Meet new friends and fight vile foes along the way. Build ships, gather trophies, load cannons, and resist the Kraken. Confront the evil pirates of the notorious Black Armada, defeat the king, and save your beloved. Test your time-management skills in more than 40 outstanding levels and 4 challenging mini-games. Are you brave enough to accept this challenge? The next installment in the Solitaire Legend of the Pirates series is here! Sail back to the Caribbean Sea with seasoned pirates on a journey to find ancient secrets buried deep in the sand and find lost treasures beyond your wildest dreams. On your journey, you’ll encounter lots of difficult solitaire layouts. Put your skills to the test! The Jolly Roger is raised and adventures in the Caribbean are about to begin... But where’s the pirate treasure? Maybe Captain Flint’s map holds the answer? No! The cards of Pirate's Solitaire know the answer - 120 unique solitaire layouts in which you’ll have to search for the pirate gold! This is classic solitaire with a new and unique mechanic – collect pairs of cards by using bonuses: mulligan, shuffle and joker. Any card on the table provides a reward, and a special multiplier can make it far more valuable. You say you’re an experienced sea dog? Then select "Sea Dog" difficulty and complete the 12 locations over again, but with new rules! Welcome to the unique pirate-style tower defense. Now the battle rages on by land and by sea! Take part in an uncompromising struggle repelling freebooters' assaults. Watch out, the enemy may catch the tide and ruin your fortress. Build towers, collect crystals, upgrade spells and believe in your victory in Fort Defense! Defend your fortress against the Pirates of the Atlantic. Blast the invaders with your cannon and keep them off your booty. Collect bonuses like multi-ball, fire-rain, and speed-ball in combat to further boost abilities, or end up sleeping with Davy Jones. Upgrade your defensive cannons with more speed, power, and a faster rate of fire so the enemy will have no hope of overcoming your skills. Get your defenses ready for the Pirates of the Atlantic! You have been selected by Her Majesty for an important mission suited only to the best of the best. Britain needs the help of pirates and your aim is to help the country take control of the vast greatness of the ocean! Find gold cards in each level to earn real pirate trophies! Use a multitude of bonuses, hints and helpful tools. Choose your difficulty and play in comfort. Complete all 12 trials, find the lost gold of past captains and earn a royal reward – the title of Admiral of the British Fleet! Go ahead! Hoist the Jolly Roger! Fair winds to ye, brave captain! Enjoy your journey from poor sailor to the richest and the most honored adventurer! Explore every corner of the dangerous seas with your ships fully loaded with canons. You can choose the way of an honest merchant and trade with farms, towns or forts. Or, you can fight for one of three nations and sink the enemy ships. Or, maybe you want to be a pirate and plunder everything you encounter? You can hoard gold, buy bigger ships and equip them with as many powerful items as you can find in towns and treasure chests all around the islands! Be well prepared before you sail into a grand battle with the most dangerous of your enemies! If you like the sea, ships, adventures, pirates, the smell of gunpowder and green parrots, this game is for you! Battle stations! The pirates are preparing to board again! Surely you didn't think that the pirates would leave once and for all? They've come back, and the peaceful fort requires your strategic mind and steady hand to defend it once more from the onslaught from the sea! Explore the expanses of the Atlantic Ocean and discover the secrets of the Bermuda Triangle as you build towers, cast spells, collect barrels of rum and lead your crew to victory! With two new worlds, 40 unique levels and five original enemies, Fort Defenders: Seven Seas delivers an entire ocean of possibilities! Experience unique solitaire challenges right on the deck of the reavers' ship. Outwit the old sea dog and seize the pirates' gold! Challenge yourself to varying levels of difficulty and several hours of exciting gameplay with a unique golden cards mechanic! Take on the role of Jack the Sharpshooter, a handsome pirate with a penchant for gold. When Jack stumbles upon an ancient casket, his curiosity is piqued and he sets out on an adventure full of magic, love, gold, weapons and a Cursed Ghost. Unravel the secrets of the ancient casket by finding Hidden Objects and get ready for the most astonishing ending! Climb aboard this swashbucklin' sea farin' saga for some pirate popping fun! Aim your cannonballs to clear away menacing chains while skillfully unlocking priceless pearls, jewels and trinkets that rain down from above. Six legendary captains met on a mysterious island to piece together the fragments of Captain Flint's map. Venture into a world filled with pirates and explore 6 unique locations! Assemble patchwork-style puzzles and guess the picture: ocean views, mythical monsters, pirate tales, sea battles and mysterious artifacts. Do you have what it takes to be the legend of the seven seas? All hands on deck! Join in the search for Long John Silver's buried treasure in this Mahjong pirate adventure! Uncover the secrets of the legendary pirate as you travel around the world to distant lands, uncovering gold tokens along the way. Each level has been painstakingly balanced with special tokens and extraordinary missions that offer a whole new perspective on a classic game! Begin your voyage aboard an old ship in the pirate seas. Much like Zuma, this Marble Popper encircles you with a chain of colored balls to blow away. Click on a ball to grab it, and aim the cursor to fire. Keep in mind that combos greatly increase the points you receive for destroying groups. Explore the world of Camelia`s Locket by creating vibrant colorful chains. Get ready for the ultimate battle in Skeleton Pirates! The pirates are after your treasure maps that are well-hidden on your ship! Defend your ship and protect your maps using an armory of cannons, catapults, bombs and other obstacles. Don't let the pirates enter your chambers to steal your treasure or lay their scrawny hands on your precious maps! Be warned, the longer you defend your loot, the more aggressive these pirates become. They will use every trick in the book, from bombarding your ship to using ropes to board; they'll even play magic tricks in an effort to reach their goal! Can you protect your ship and crew from these boney bandits? It's a little-known fact that pirates fought not with cutlasses and cannons, but with real match-3 might! Help the Pirate Captain find his missing fiancée, Pepper, and retrieve the stolen treasure map in Caribbean Jewel! Together with the Captain and his trusty crew of pirate pals, you must take to the high seas and recover the long lost Treasure of Tortuga in this entertaining Match 3 adventure. After being in a shipwreck, you find yourself onboard the legendary Flying Dutchman! Win your freedom in this Match 3 game! Put your soul on the line as you play against the crew members and try to pay for your journey home. With a magnificent atmosphere and gorgeous graphics, The Flying Dutchman – In the Ghost Prison will keep you entertained for hours! A perched parrot and a wooden leg aren`t enough to keep your "mateys" in line. Refill your grog supply at local Pirate Towns to keep your crew in check. 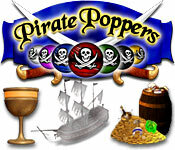 Use clues in this humorous Match-3 puzzle game to navigate your ship through several Caribbean Pirate Quest maps. Search for ten legendary treasures and earn upgrades for your ship. Be careful not to make too many mistakes, or your jaded crew will feed you to the jaw-snapping sharks. Go Hawaiian all over again! This spectacular and explosively charged match-game of adventure will captivate you as you dive with Humpback Whales, discovering new and exotic fish at every turn. Creative designers from around the world deliver over 750 of the most delightful and fantastical levels ever to be found in the deep blue sea. With its breathtaking effects, dynamic explosions and thousands of new levels to download online, what are you waiting for? Come back to an underwater paradise! Play Finders Keepers and join Floyd Finders and his trusty sidekick Goldie in this aquatic adventure! Collect treasure, fish and special trinkets to help reunite lost loves, all while trying to avoid trouble from Pirates, Whales, Walruses and Ghosts. Finders Keepers will let you play at exciting and exotic places like the North Pole and even the resting place of the Titanic! Watch out for adversaries as you search the Atlantic to retrieve something very special to Floyd. While on a yacht trip in the Sargasso, you suddenly find yourself trapped in a fierce storm. Struggling with the elements you've lost consciousness, and when you come to your senses, you see a strange place resembling an island of abandoned ships. But soon you realize that the island is far from deserted... What is this mysterious place? How did you get here? What secrets are hidden on this island of abandoned ships? Is it possible to get out? Answer all these questions and more in Mystery of Sargasso Sea! To sail or not to sail? What kind of question is that! While others mull it over, you can be the first to find the pirate cache! Somewhere out there, at the bottom of a mysterious lake, lies the secrets of times long past: a crystal capable of giving youth, a cup which can give eternal life with a single sip, and a gold doubloon which brings luck to its bearer... All of this could be yours, if only you get to the island before anyone else! So onwards, summon your crew and set sail! Your journey promises to be risky, but they don't call you a courageous captain for nothing, right? Go ahead! Hoist the Jolly Roger! Fair winds to ye, sea dog! Fairy Island was a magical place untouched by human hands. But when Pirates wash up on shore, it spells trouble for everyone. Now the poor fairies are trapped inside magic crystals, and it`s up to you to break them out. On your quest, you`ll travel across the enchanted forests of Fairy Island, collecting golden acorns along the way. Then visit the Fairy Fare, where a golden acorn can buy unique fairy magic. Batten down the hatches and blow the man down! It's time to play Claws & Feathers 2! Match birds across dozens of levels to reach a legendary artifact in this all-new, pirate-themed sequel! Bright, colorful graphics, upbeat music, and a hilarious storyline will keep you entertained until the end! Captain on the bridge! Cast off the lines! William Kidd's treasure awaits! Set sail from Port Royal on the Golden Hind and head for Hard Luck Island. Legend has it that untold treasures are hidden there. The treasure trove's location is encoded in special tiles which you will have to remove to reach the gold! The greed and generosity of pirates knew no bounds. The smuggler's path wasn't easy – goals and limited moves will present a serious challenge to your abilities in Mahjong Gold 2: Pirates Island! 1st Runner-Up Best Adventure Game of 2008! Adventure runs in the family! Join Nelly and Tommy in their quest to retrieve their pirate grandmother`s hidden treasure! Test your skills with challenging puzzles that will take you from strange laboratories to the dangerous depths of the ocean. Play at your own pace with no timers or penalties, just hours of brain-tickling Hidden Object fun. Set sail with Treasure Seekers: Visions of Gold today!